REPORTER FILE PHOTO The election of November 8, 2016 will have far reaching consequences in Suffolk County. The astonishing win of the U.S. presidency by Donald Trump on the Republican ticket has, to put it mildly, overshadowed all other political news out of the 2016 election. TIMES/REVIEW FILE PHOTOS | Southold Town Councilman Al Krupski , left,and Riverhead Town Supervisor Sean Walter will face each other January 15 in a special election for Suffolk County Legislature. Riverhead Supervisor Sean Walter will face Southold Councilman Al Krupski for the 1st District seat in the Suffolk County Legislature in a special election that will likely be held Jan. 15, officials said Tuesday. Ed Romaine (R-Center Moriches) vacated the legislator post Monday, as he was sworn in as Brookhaven Town supervisor. Mr. Walter said he was encouraged in recent weeks by state and county elected officials to run for Legislature, and that he feels it’s his time to move on to county government. “They asked me and I’m very happy to do it,” said Mr. Walter, who’s in his second two-year term. He pointed to steering new businesses to Main Street, improving the town’s financial picture and moving toward the creation of a subdivision at EPCAL as major highlights of his tenure as Riverhead supervisor. He said his work on these major areas of concern to Riverhead residents are a reflection of what he can do in the Legislature. “The economy and taxes are the biggest issues facing the First Legislative District,” Mr. Walter said. “We have to bring economic growth with balance. The subdivision of EPCAL fits right into that balance because it is the place in the district where we should have economic growth. Mr. Walter also said his work to preserve farmland on the North Fork and to protect the agri-tourism market fits into the role he would play as a legislator. “I don’t shy away from a battle,” he said. Mr. Krupski said he’s looking forward to the challenge of facing Mr. Walter in a rare Suffolk legislator matchup pitting a current elected official from Southold Town against a current elected official in Riverhead. Mr. Krupski said the issues he’d face at the county level are similar to those he’s already dealing with in Southold Town. Mr. Krupksi was the only name mentioned by Suffolk Democratic Chairman Rich Schaffer on Election Night, and he quickly emerged as the clear-cut choice. Suffolk Republicans, meanwhile, waited until the day after Mr. Romaine’s inauguration Monday to name Mr. Walter as their guy, even though Suffolk County Republican Chairman John Jay LaValle said at the inauguration that a decision had already been made. Mr. Walter emerged as the nominee from a group of four finalists that included fellow Riverhead Town Board members Jodi Giglio and John Dunleavy, and Romaine aide Bill Faulk. Mr. LaValle said that even though Mr. Walter has battled with Ms. Giglio and other Republican Town Board members, and Mr. Krupski has long had the respect of Republicans in Southold Town, he believes both town Republican committees will do their part to assure Mr. Walter wins in January. He said the debate among Republicans has only helped improve Riverhead and he credited Mr. Walter with much of the success. “He’s resurrected a Town of Riverhead that was stagnant for a number of years,” Mr. LaValle said of Mr. Walter. County legislators are expected next week to set the date of the special election for Jan. 15, though by law they have 90 days from Monday, when Mr. Romaine stepped down as county legislator. Both Mr. Walter and Mr. LaValle both said Tuesday that they’d prefer to hold the election in February to give 1st Legislative District residents more time to learn about the candidates. They also said a February election could be held in conjunction with a special election for Brookhaven Town highway superintendent — a move they said could save Suffolk County taxpayers $100,000. 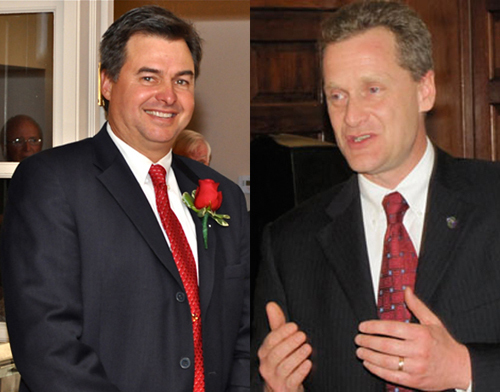 The winner of the 1st District special election will represent Shelter Island in 2013, before redistricting moves the Island into another district. Tim Kelly contributed reporting to this story.